What job do you want your robot to do? What environment will they be working in: cold? hot? wet? 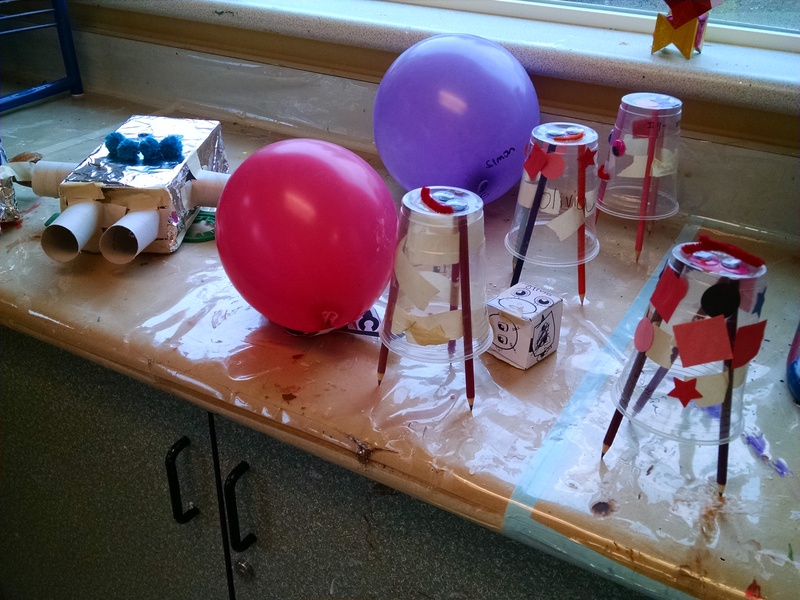 What did we learn about when we studied habitats that you could use in designing your robot? What tools would they need? Remember when we learned about different bird beaks and the different things that birds eat? They need to have the right tool to get their food, right? How do you adapt your robot for what they need to do? When you build a robot, do they need a skeleton (or some internal structure) that helps them stand up? Would they be soft on the outside, or have a hard material like an exoskeleton to protect them? 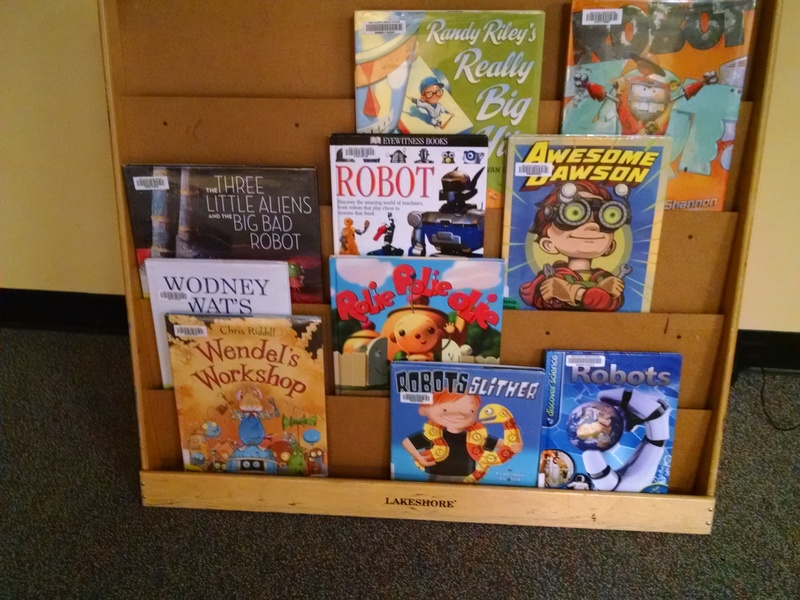 In Opening Circle, we read the book Robots Slither by Hunter. 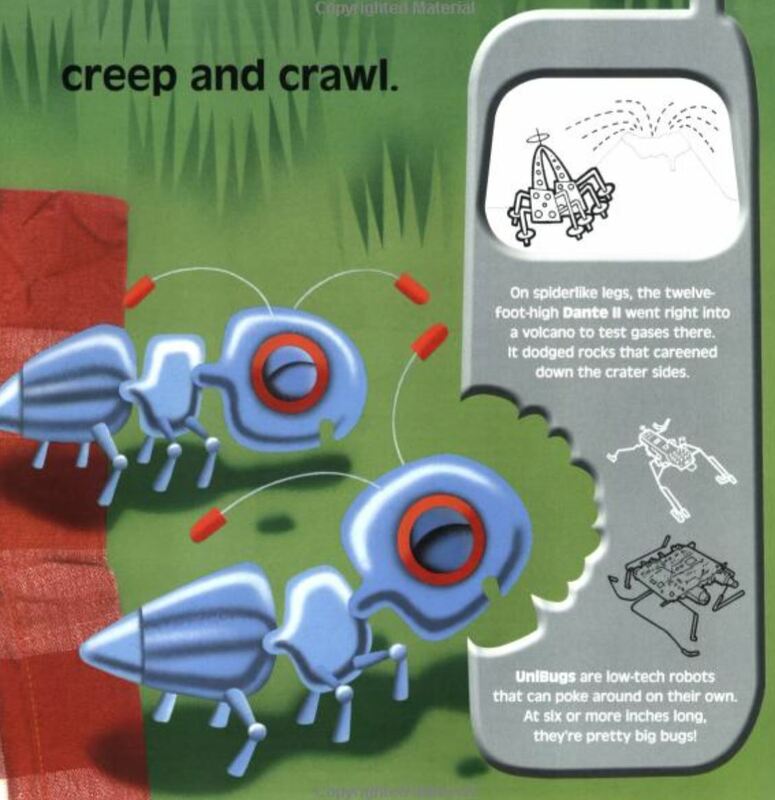 The main story line is preschool appropriate language for our little ones “Robots slither, creep and crawl. Robots inch along the wall.” Then there are illustrations of imagined animal-inspired robots, and sidebars with information about real robots and the work they do. Design time: Within our two hour class format, we don’t set aside design time. 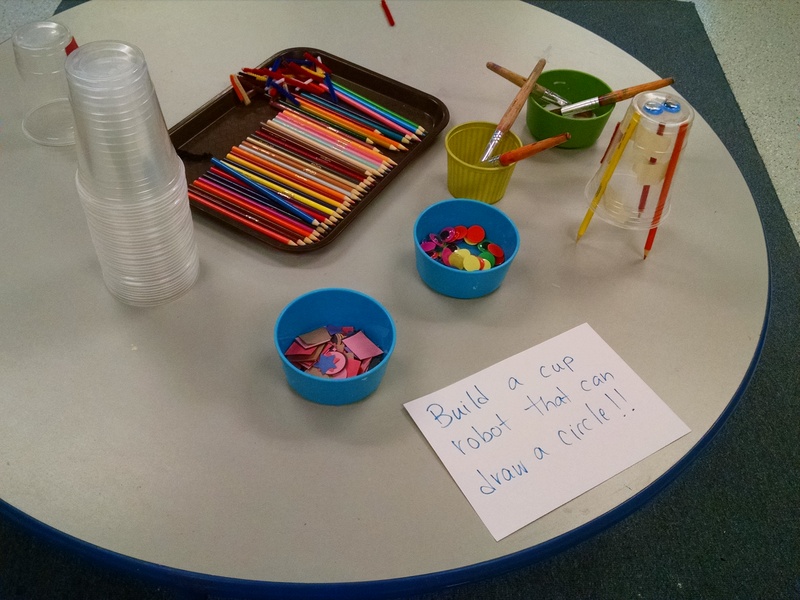 Our younger kids just don’t think abstractly yet – it’s better to just get them working hands-on. 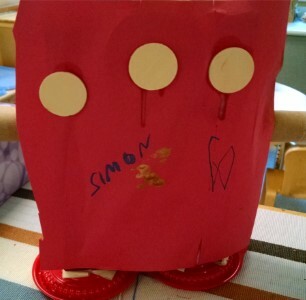 But if you’re working with your child at home, or a group of kids who are all over age 5, the first step of this unit should be to introduce the big idea, as above, then hand them all pencils and paper and get them to start brainstorming design ideas where they imagine – if they could design any robot they wanted to – what would it be? 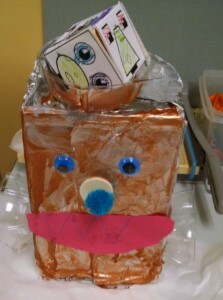 Ask them questions about what job their robot will do and in what environment to start guiding their thoughts. This is mostly about drawing an idea. 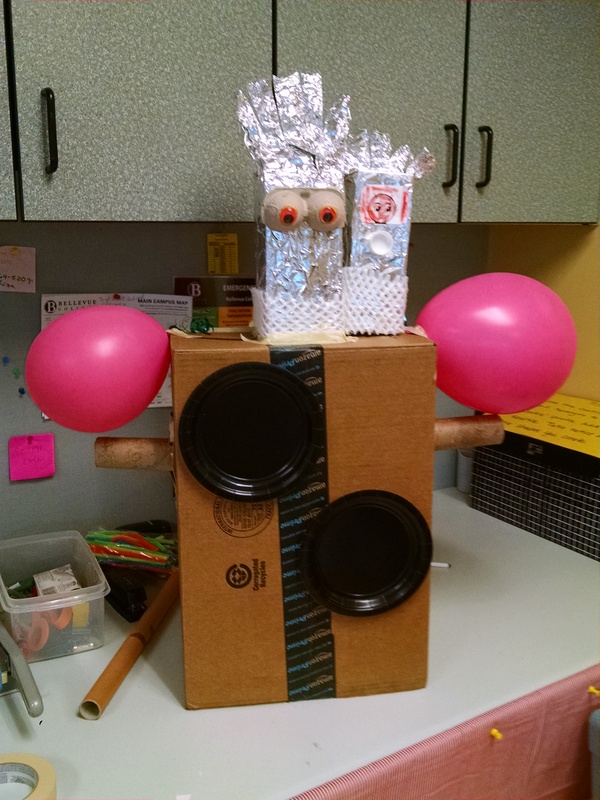 Although you can also have them make model robots, as we did, you may want to present these as a different robot, since they might have challenges trying to re-create their grand ideas with cardboard and masking tape. Giant robot: We also build a giant robot as a collaborative project. 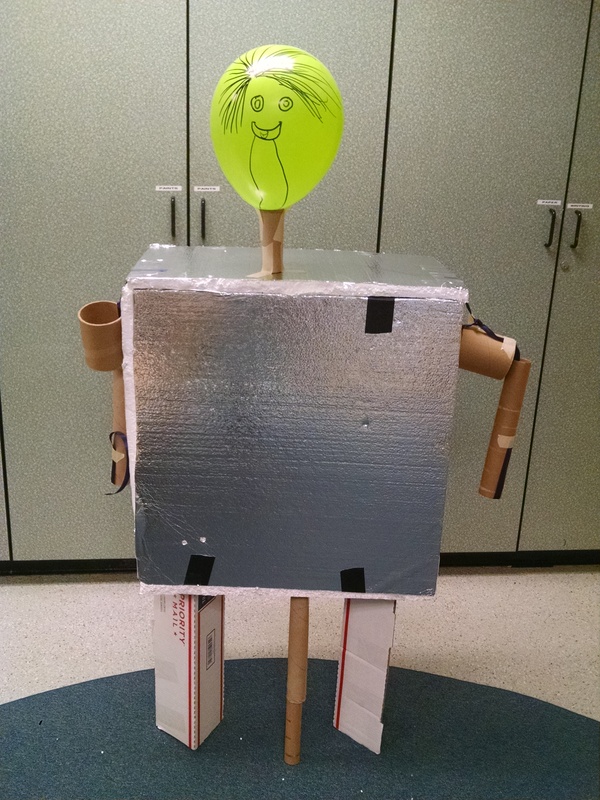 Note that he’s a tripod… he had two triangular legs that just weren’t stable, so we had to add a third leg. The challenge with the giant robot was that we had one student who really wanted to knock him over and he was too fragile to withstand that. 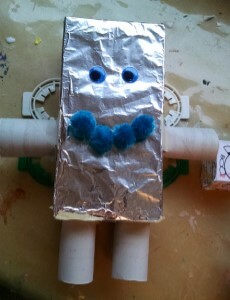 Jointed robot: We printed robot designs the kids could cut out and assemble – good small motor practice. 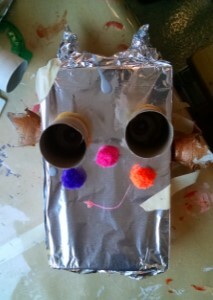 They could then be mounted on popsicle sticks to make puppets. 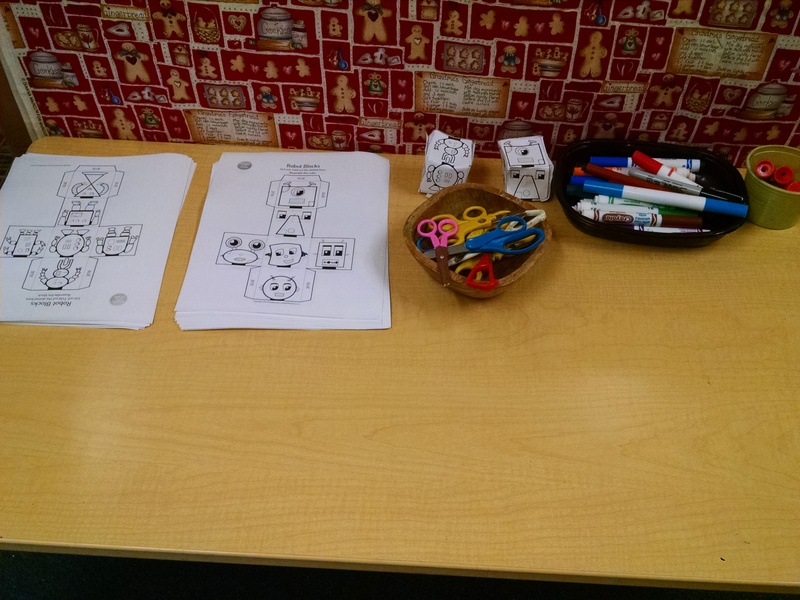 Robot blocks: Using this printable from Create in the Chaos, kids colored in pictures, cut them out, and assembled them into blocks which could then be used as mix and match robots. Print these on cardstock! 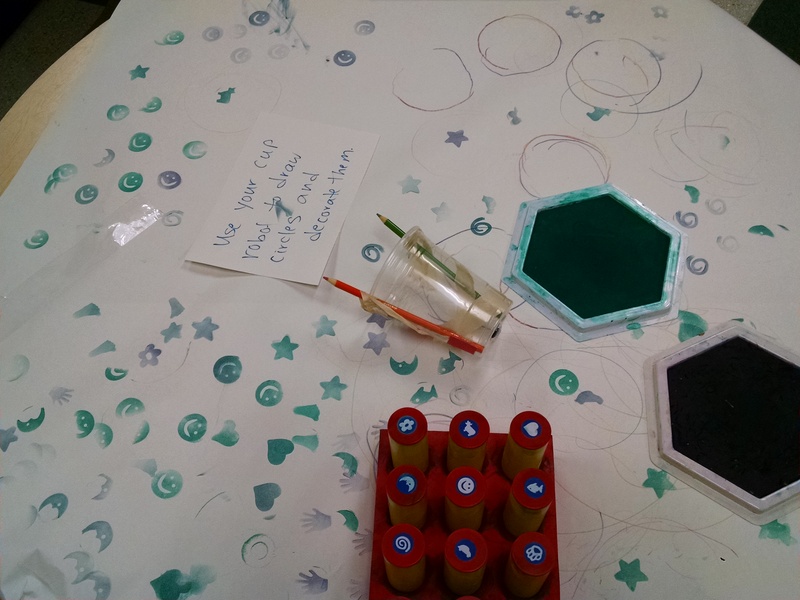 We learned that regular copy paper just couldn’t hold its shape as blocks, so we glued the paper onto cardstock but it would be much easier to start that way. 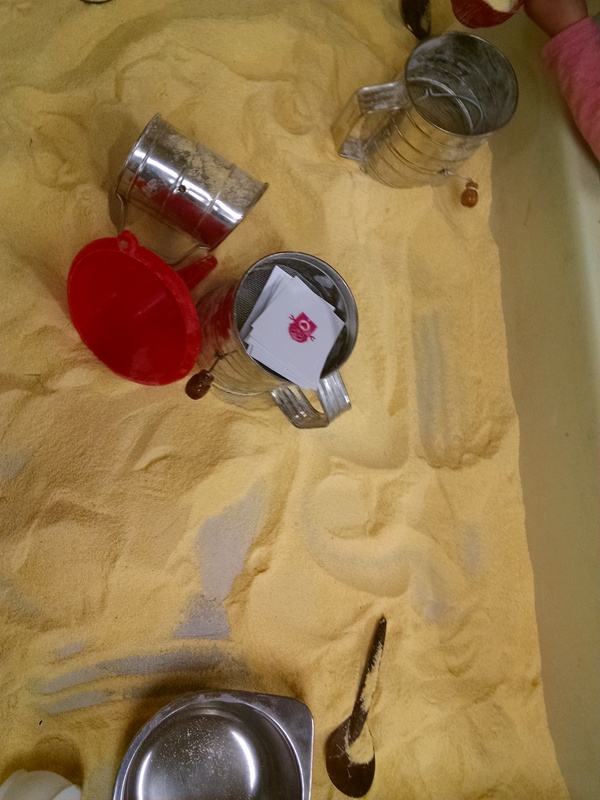 Sensory table: We played robot hide and seek – put robot stickers on index cards, and buried them in the corn meal to find and re-bury. 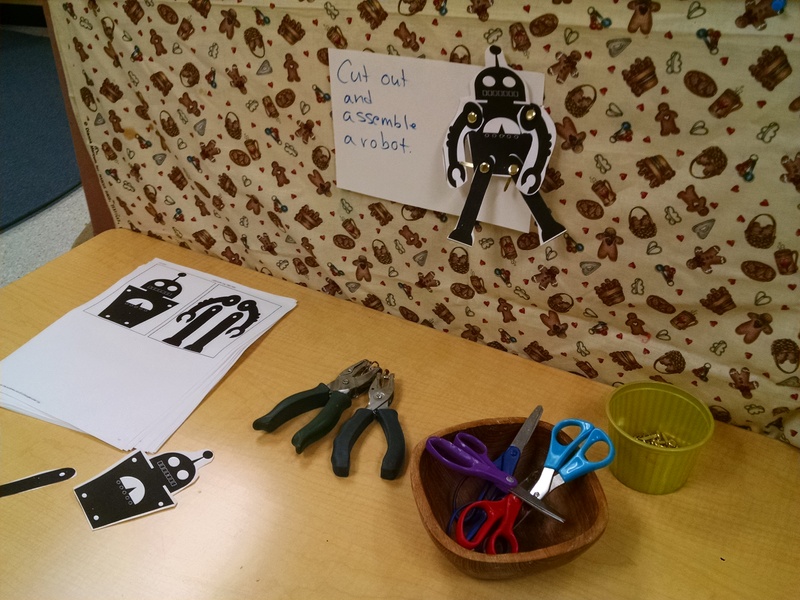 Robot game: We had a Build a Robot game in the closet we put out, plus a variety of building activities. 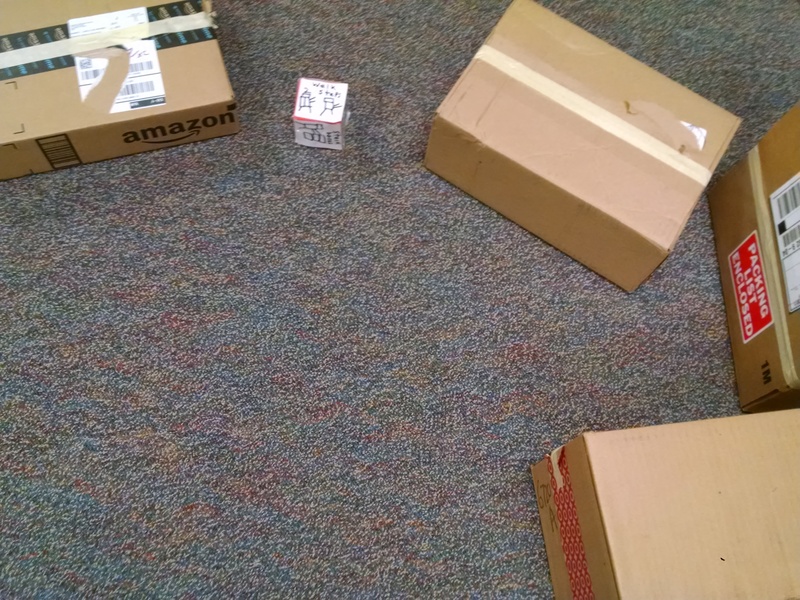 Roll the Die: You set 5 blocks around the room (we used cardboard boxes). Kids roll a die which tells them how many steps they can take. When they arrive at the box, they roll the die to see if they can pick up the box, stack the box, etc. This was a good beginning idea, but we needed to figure out the game mechanics in more detail. Coding Game Online: There’s also an online Star Wars themed coding game: https://code.org/starwars. It teaches the skill of dragging in blocks of commands, then running the program and seeing if the droid does what you wanted it to. Our five-year-old can do this, but I wouldn’t expect a 3 or 4-year-old to be able to understand. Recommendations? 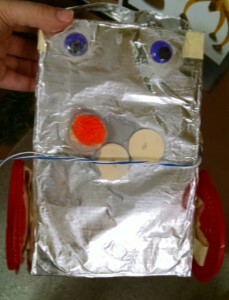 Next year, we’d love to add in some simple robotics kit or a robot toy that can follow commands, or something like that. Do you have any recommendations for products? If so, share them in the comments! Addendum: Next year, we’ll add this Duplo hockey robot as one of the self-guided activity stations. You show a box of unknown toys. Big screws,big white blocks with holes for the screws etc. I’ve been searching for those toys for a long time. Any chance you would be willing to sell or trade me for more toys? I now have a one year old that I’ve been looking for learning toys that I had as a child and you have a big box of them. Please contact me if you would be willing to part with them. I believe they were a build and play set from ideal toy CO. They were in the middle of merging with Mattel toys at that time. That set you have doesn’t exist anywhere I’ve looked. I still have my small set. Would like to expand it for my daughter. The toys belong to a different class whose space I share, so unfortunately they’re not mine to decide what to do with. Sorry! Bummer. Thank you anyways. Appreciate the reply.